Us Brit bloggers were feeling pretty gutted to have missed out on rewardStyle’s infamous event; #rSthecon – you just have to search the hashtag to see all the fabulous fun that was had by those lucky bloggers across the pond! But on Thursday night, rewardStyle invited a few brit bloggers to their super cool offices in East London, so that we could catch a first glimpse of the new trends coming into Topshop. My very first job in retail was in the Knighstbridge Topshop store, and since then I’ve always been a big fan of the brand – I just love stocking up on trend-driven pieces at a fraction of the designer price tags. Each season, they always seem to know exactly what I want – so, needless to say, they are partially to blame for my scary credit card bills! Before I carry on, i’d better just tell you a little about rewardStyle, as any non-bloggers out there will be wondering what the heck I’m on about! RewardStyle was created in 2011 by the uber glamorous Amber Venz – the 26 year old blogger wanted to find a way for bloggers to be compensated for the work they put into their blogs, and styling edits. RewardStyle officially changed the game of blogging – created for bloggers, by bloggers and the process is really simple and organic. Joining rewardStyle is invite only, but you can find out more by visiting their website. We were treated to scrumptious cocktails (rewardStyle have their own bar in their office, how cool is that!) 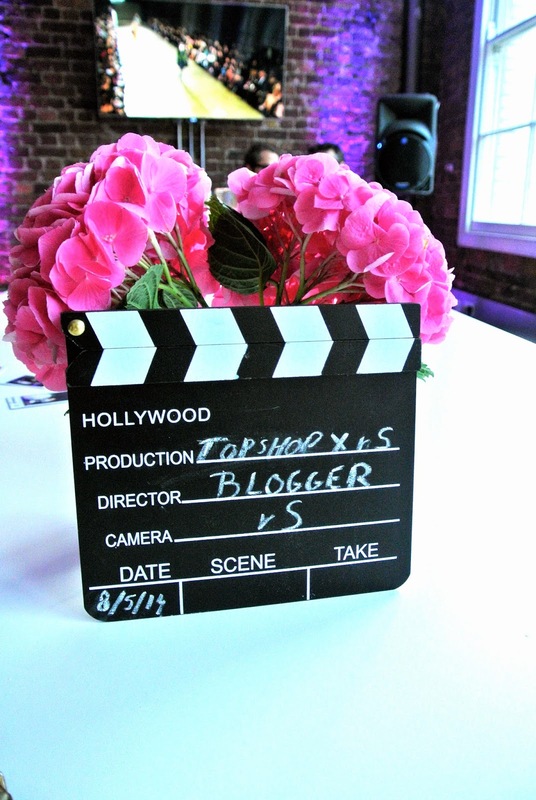 and sushi nibbles while we chatted to other blogger, as well as the girls from Topshop. Lizzie Dawson, Topshop’s design manager talked us through her favourite pieces for the upcoming season, and us bloggers all agreed that the white trend is our fave too – I can’t wait to snap up some chic white cigarette trousers to wear with floral heels and a silk top. Another key trend is the tropical design print – some unusual graphics in bold, caribbean colours will be making their way in store as summer approaches. Also dotted around the room were some gorgeous accessories, and I absolutely fell in love with this light pink soft leather backpack. It costs £80 from the premium collection and I think it will just be the perfect accessory for summer! I’ll be snapping this up next time I’m in store! As if endless cocktails and canapés weren’t enough, we were also treated to a goody bag from rewardStyle, which contained some Topshop Makeup and even a Topshop Voucher – so generous! So a thank you rewardStyle and Topshop for hosting such a fab evening, it was great to meet so many lovely bloggers and fashionistas and I can’t wait for the new trends to hit the shop floors!